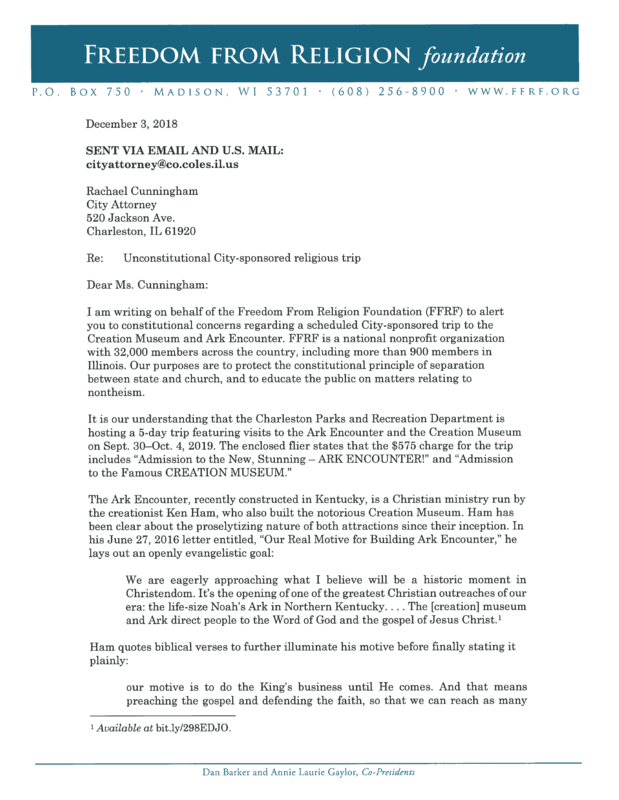 Yesterday I reported that the Parks and Recreation Department of Charleston, Illinois was sponsoring a trip for locals to visit Ken Ham’s Ark Park as well as his Creation Museum—both in nearby Kentucky. You don’t have to know much about the Constitution to realize that this is a violation of the First Amendment, as it puts government—in the case the city’s Parks and Recreation agency—in the position of promoting religion (literalist Christianity). 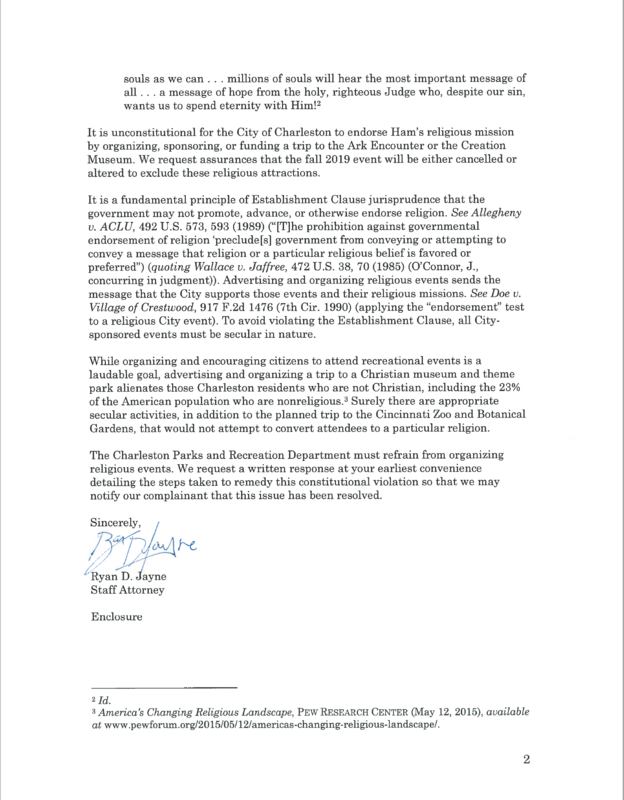 The letter enclosed the trip prospectus from Parks and Recreation, below. 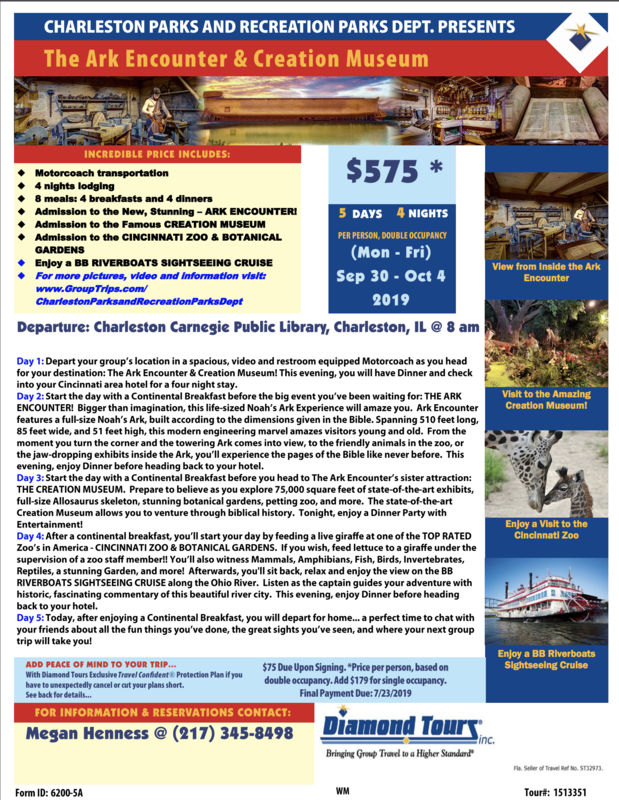 Note, with reference to visiting the Creation Museum, the preachiness: “Prepare to believe as you explore 75,000 square feet of state-of-the-art exhibits, full-size Allosaurus skeleton, stunning botanical gardens, petting zoo, and more.” Prepare to believe! Yes, this is all endorsement of religion by the local government, and it’s illegal. Now this is a no-brainer, even in southern Illinois, and the city had best cancel that trip or completely eliminate any connection that they have with it. There’s no way that even a Republican judge can find this entanglement legal. I’ll let you know what happens. This entry was written by whyevolutionistrue and posted on December 4, 2018 at 8:45 am and filed under felids, First Amendment, freedom from religion, Intelligent Design Creationism Watch. Bookmark the permalink. Follow any comments here with the RSS feed for this post. Both comments and trackbacks are currently closed. While I share Mr. Coyne’s view, I think that it is optimistic to say that “There’s no way that even a Republican judge can find this entanglement legal”. In my experience, a motivated (ideological) judge can find almost anything legal if he applies himself to the task. There is also the appeal process. But I am betting the school bows out before it even goes to court. They’re not going to spend a lot of money defending something like this in court. Unless one of these “pro bono” religious-crusader legal groups decides to get involved, then it could be off to the races (although Jay Sekulow — who’s turned his American Center for Law & Justice into a money trough — seems to be occupied at the moment representing the fool in the Oval Office). Again I say great show. Glad to be a member of this organization that fights these unconstitutional attempts to promote religion by government agencies all over America. I receive their regular emails on their efforts and their monthly magazine. Thank you to the hard -, hardworking freedom – vigilant and – protecting folks of the Freedom From Religion Foundation. 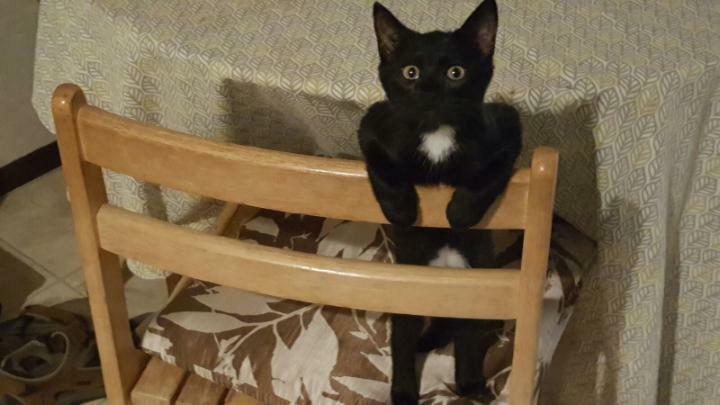 O ! Thank YOU, Dr Zuk ! This is very encouraging. I sent a note to the Parks and Recreation asking how they thought this trip was justified. Dawkins would call this child abuse. How can it not be? Lying to a child about how the universe they occupy works? At best it will lead to minor confusion and regret for being lied to and at worse a lifetime of dealing with the effects of inconsistent scientific understanding not just of evolution but distrust in all scientific data. Having done a fair amount of marketing in my professional life, I have to wonder if this tour idea originated elsewhere than the Charleston Parks & Rec Dept. Good chance someone employed by Ken Ham is reaching out to all kinds of groups in the hopes of increasing attendance and revenue. Most likely they’re pitching a deal where the group members get a break on the admission fee, and the group itself gets a piece of the action for bringing people in. So some P&R staffer saw this is a chance to boost the dept. budget by maybe a few $1k’s. Which is a fraction of what they’ll pay their lawyers in their first sitdown to deal with the lawsuit(s). No surprise they dropped it. Hard. I’m guessing they have so many friends in government that they are going to continue to try to gain footholds wherever they can. Many (most?) Republicans and some Democrats see it as righting a wrong. Just as we on the Left wish the 2nd Amendment didn’t exist, they feel the same about separation of church and state. Diamond Tours sponsors a similar trip independent of the Charleston tour. Be prepared to have this characterized in the right-wing media as an atheistic war on Christianity, that it is promoting open hostility to religion. Seems like a clear violation of the Establishment clause to me, but I’m not so sure it’s a legal “no brainer” — not with a case-law backdrop that allows “God” on our money and in our pledge of allegiance, that permits benedictions before governmental assemblies, and that enables Christmas displays on public property. The case cited by FFRF, County of Allegheny v. ACLU, is one in a series of Christmas “crèche” cases decided by our federal courts. These cases are anything but a model of jurisprudential clarity. Indeed, the Allegheny County case itself — over the course of a seven-part opinion, with shifting judicial majorities — prohibited the display of a crèche in a courthouse but upheld a holiday display (which included a crèche, a Christmas tree, a menorah, and some angels) in front of the city hall next door. Were this case to work its way up to SCOTUS, there’s a very good chance the five-justice conservative majority would find a way to rule in the Charleston Parks and Recreation Department’s favor, and to make some damn bad case law in the process. Don’t you think the courts would see that this goes far beyond allowing a religious creche in a public space. The government isn’t merely allowing a religious display on public property, in this case they are facilitating and promoting a religious view and have attached the government’s name to it. They are acting as Ham’s partner in this and that is very different to allowing religious displays (so long as none are favored) on public property. That seems manifestly exactly what the 1st was intended to prevent and I can’t imagine the Supremes seeing otherwise. I should hope so, Mikey, but there are several justices on SCOTUS who interpret the Establishment clause merely to prohibit government from favoring one religion over another — that the government need not be hostile to religion, but can engage in practices that generally celebrate the nation’s deep religious roots. And I’m all but certain that the two most recent Court appointees have at least as strong of views in this regard as the three conservative justices they’ve joined. If the Parks and Recreation Department can show that it’s willing to cart Jews or Muslims or any other religious group that can fill up a bus to similar institutions, a majority of the sitting justices might find that that’s enough to overcome Establishment clause objections. I share your concern considering the makeup of the present Supreme Court. The question is whether Charleston wants to push the issue. It may be looking for a right-wing group to bear the enormous legal costs in such a battle. Or, perhaps, a right-wing group will seek it out. I’ll be using variations of that again for sure! The policy of sitting around attempting to determine how those on the right and or religious are going to vote or react is a waste of energy. If FFRF considered things this way, they would never get out of bed. I suppose one could feel the same outrage about a municipal bus trip to a natural history museum. This one to a museum that teaches that Genesis is true, the other to one that teaches that Genesis is literally false. Meh. Personally I’m in the latter camp, but I think that science needs to find better ways to be persuasive, something it evidently is still trying to do. Nope; the courts have ruled that creationism is a religious viewpoint, not a scientific one. They haven’t ruled that science is religion. Ergo you can bring a lawsuit for a trip to a Museum, but not to the Ark Park. As for your “meh,” well, I don’t much care about it. And the failure of Americans to accept evolution comes not from scientists’ failure to teach it (for crying out loud, we have Attenborough, Dawkins, Steve Gould, and tons of similar popularizers who are damn good at teaching evolution). Opposition to evolution comes from one place: religion, a form of human exceptionalism. I was talking about what a person might feel outrage about, not what people can bring lawsuits about. The courts are only empowered to decide the latter. But then again, I think nobody has ever been so silly as to bring a lawsuit challenging a bus trip to a natural history museum. Anyway, perhaps part of the problem is that evolutionary science itself evolves (Thomas Kuhn and all that). Gould is not quite the same as Darwin and Wallace, and group selection is still, as far as I know, rather up in the air. The ability of science to evolve is its virtue, of course, but it depends on persuading others, not on blaming them for not being convinced. Religion is not the reason for opposition to evolution. Religion precisely *is* the opposition–much as classical physics is the opposition to quantum mechanics and folk psychology is the opposition to physiology-based behavioral science. Over time, beliefs yield to better beliefs, in a process of persuasion, but people are rarely persuaded by those they do not have confidence in. The natural history museum will not teach that Genesis is false. It won’t even bring it up. Also, what is experienced at a NHM is not religion. I have never seen a natural history museum that “teaches that Genesis is literally false”, or for that matter, even mentions Genesis. Oops, I see now that Mark has said the same before. Great minds think alike. Keep us posted on the developments. It’s always gratifying to hear about the FFRF taking action like this. Sort of like Superman flying into town to thwart a bank robbery. I can’t help but suspect that the evangelicals are anxious to get cases before the Supreme Court as fast as possible, now that they have their appointments. So I wouldn’t be surprised if this goes that far.